We used to be able to buy a packed dry apple pieces in the form of crisps, I used to love them so much and couldn't get enough of them. 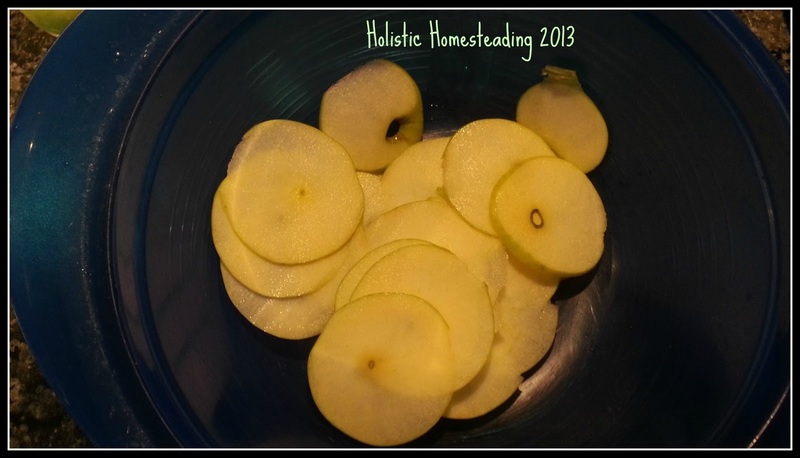 I decided I would not be beaten and created our own similar recipe for the dehydrator. 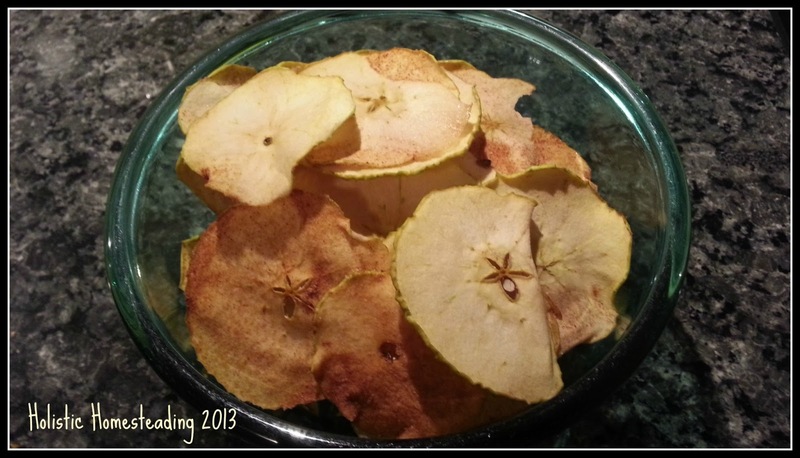 Not only are these a delicious snack, but you can regulate how much of what goes on to the fruit you are drying. 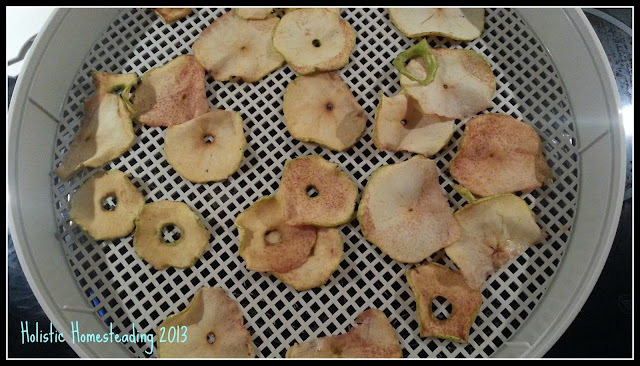 I used 2 apples for this recipe, and it filled up 3 trays of the dehydrator. First, slice the apples to a mediocre fineness - I use my nifty mandoline. Slice one apple at a time. 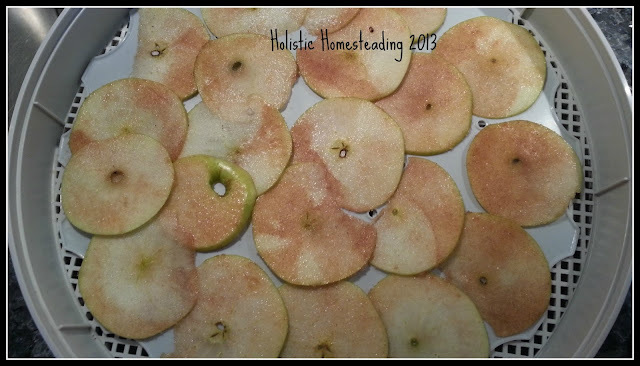 Once coated lay the apples out evenly on the trays. I use the silicone inserts for the first hour or so, it helps them not stick to the trays straight away. 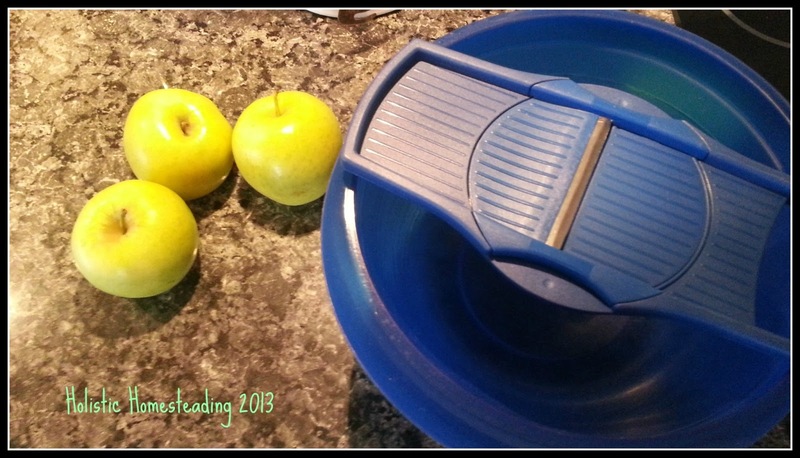 If you do not have silicone inserts, then it is advisable to turn the apples a little more frequently. I dry them at 50°C, but that is my preference, you can dry them at a warmer temperature if you prefer. I turn my apples over after about 2 hours, but every 45 minutes I re-stack the trays - bottom tray comes to the top of the pile and they all move down a layer so-to-speak. After 2 hours I remove the silicone inserts and continue to dry them. And they are ready to devour!!! YUMMY! Great snack idea!!! Thanks Natalie! Yum! Found this post on A Favorite Thing. 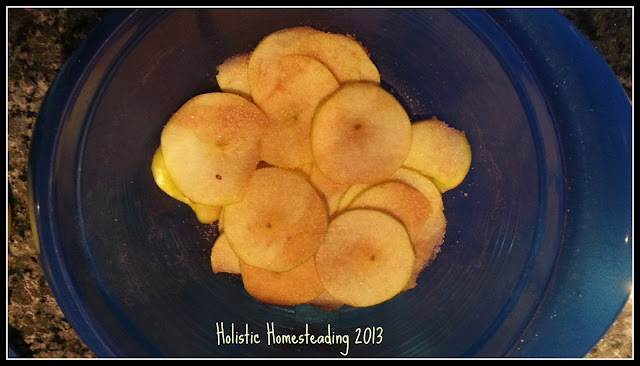 :) I would love to have you join me again tomorrow on The Creative HomeAcre Hop! My pleasure, thank you for visiting. Yummy! I have been thinking about buying a dehydrator! I think I need to ASAP! I think it is such a great investment, there are soooo many things you can do with it. How long would you say these chips are good for? I just got a dehydrator from my stepmom and I'm curious of shelf life on things like these chips? 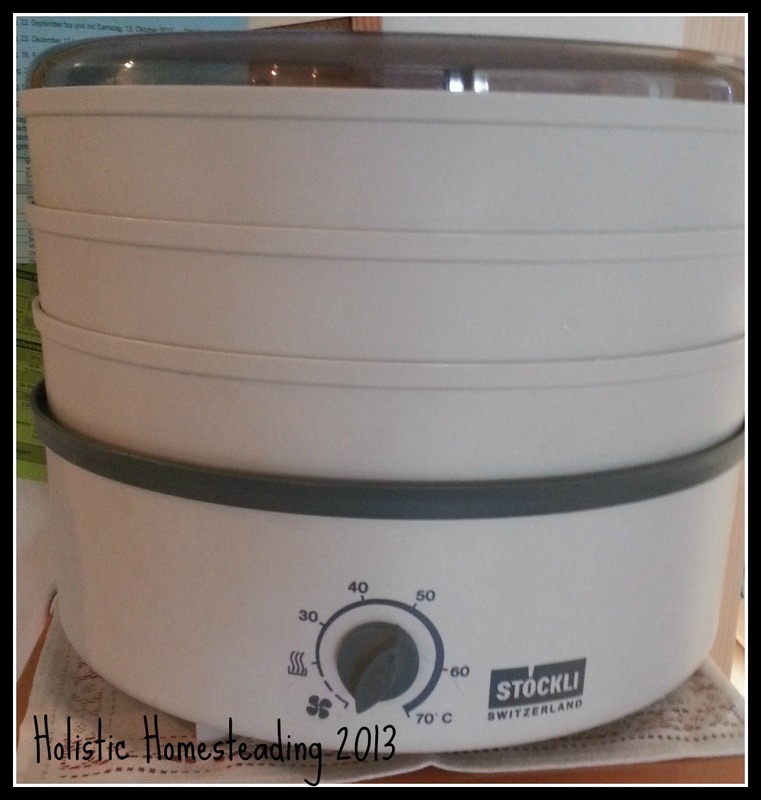 If you have a vacuum-machine they would last quite a while I think, unfortunately I have yet been able to try and keep them, because as soon as they are out of the dehydrator they are gone! I do think it would help to keep them fresh and crispy by adding either rice or a packet of the drying beads. Aha, Bitschgi bleibt drin und mit dem Kabishobel gehts auch besser als mit dem Messer gescnhitten. Stöckli habe ich auch. Die Plastikgitter sind einfacher zu reinigen und hygienischer als die metallenen von Dörex. :-) Danke für den Tip! Schafwolle als Isolationsmaterial ist SUPER!